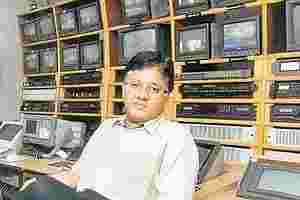 Mumbai: Kalanithi Maran’s Digital Radio Broadcasting Ltd plans to form a network that will encompass its Red FM 93.5 and radio stations owned by his media group SunTV Network Ltd such as Suryan FM and SFM , consolidating their sales forces and potentially saving on costs. A launch plan is being developed by ad agency Ogilvy and Mather Pvt. Ltd, people close to the development said. Maran has a 48.9% stake in Red FM, which operates in Mumbai, Delhi and Kolkata. Hyderabad-based IT company ValueLabs, broadcaster NDTV Ltd, and Astro Group hold minority stakes. The proposed new radio network is expected to leverage the Red FM brand for other radio stations within the SunTV fold, tap sales synergies and consolidate advertiser relationships, people close to the development said on condition of anonymity. It would provide a common advertising sales platform for the radio stations, and could increase ad volumes and rates for the stations, these people added. Red FM’s chief operating officer Abraham Thomas was not available for comment. SFM officials declined to comment. According to the SunTV website, SunTV Network holds licences for 45 FM radio stations across the country. A common sales platforms could help media companies in cash-tight times and media specialists see merit in a collaborative approach. “They can consolidate rate cards, address multiple geographies, optimize selling costs and give a larger, varied offering," says Chandradeep Mitra, president, Mudra MAX, Mudra Communications Pvt. Ltd. Both SunTV-owned radio stations and Red FM are doing well in their respective geographies—Sun brands in the southern markets and Red in New Delhi, Kolkata and Mumbai—and can leverage their client relationships better, Mitra said. “This is a time when everyone’s under tremendous cost pressure. Also, getting good sales teams is difficult. This makes it easier for all concerned," he added. The Lintas Media Guide says that advertising spending on radio in 2007 was Rs529 crore, a 28% increase over the previous year.